Resource Evaluations — EnviroMINE, Inc.
Mining companies must continuously search for new resources which can be a time-consuming and costly endeavor. EnviroMINE provides a number of valuable services directed at identifying and obtaining new resources for our clients. These services include resource quality assessments, evaluation of historical production rates and mining methods, geological reconnaissance, resource development and constraints analysis, market analysis, environmental permitting, and miscellaneous project management functions. 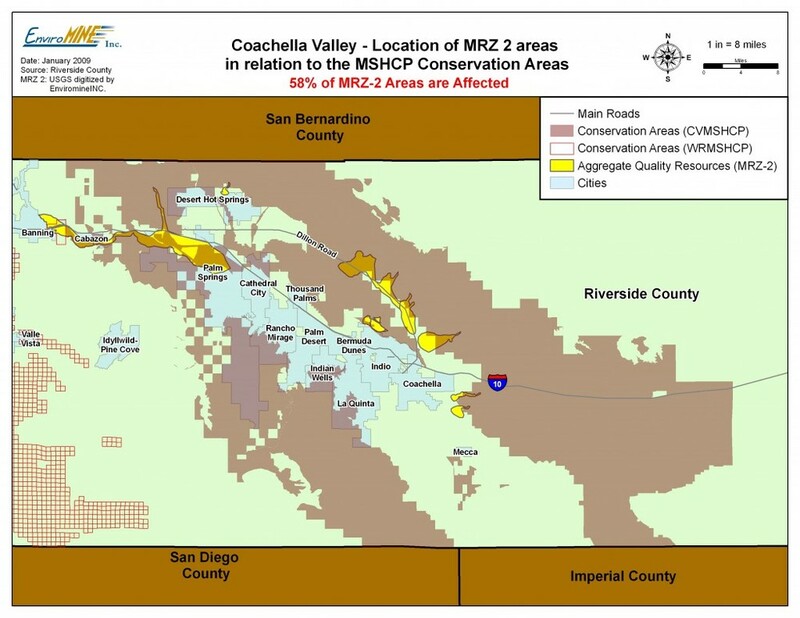 MRZ-2 Location Analysis in Western Riverside County. Click to enlarge map. EnviroMINE also conducts site selection analysis to locate properties suitable for mining, batch plant operation, C&D recycle centers, and heavy construction projects. These studies include evaluation of general plans, community plans, zoning requirements, land use entitlement process, air quality concerns and market studies, among others. The firm is experienced in finding suitable sites that minimize land use issues, maximize profit, and limit an investor’s liability during the acquisition phase.